Uncomfortably large and just as brash, the Galaxy Note 4 is set to land on European and U.S. stores some time next month, but it’s already gone on sale in South Korea. 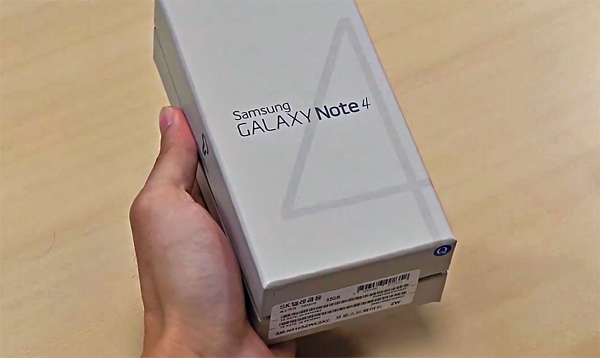 That’s led Samsung Korea to post a video showing the first Galaxy Note 4 to be unboxed on camera, and it does look decidedly tasty. Apple’s mammoth iPhone 6 Plus may be king of the hill right now, but that may change once Samsung comes to town with its mighty, all-dancing and singing phablet. Featuring a 5.7-inch screen that packs a Quad HD display – that’s 2K resolution for all you geeks out there – the Galaxy Note 4 is the successor to a line of popular and huge phones that have garnered something of a cult following. It’s arguable that Apple has joined the phablet fray, but Samsung itself has admitted that it has brought the launch of the Galaxy Note 4 forward slightly in order to combat the positive traction that Apple’s iPhone 6 Plus has been gaining.